Using a healthy alternative to regular buns. 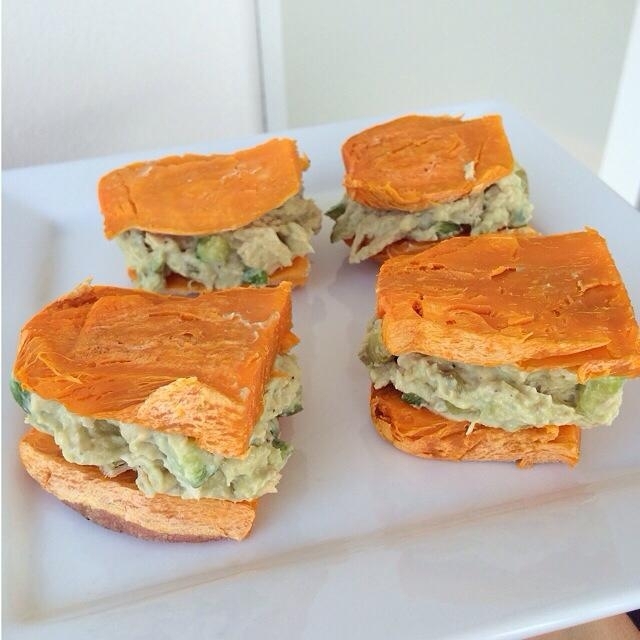 Tried using sweet potatoes as buns today. Just took a small sweet potato and poked it in 7-8 places. Wrapped in a damp paper towel and nuked it into the microwave for 4 minutes. Then sliced it. For the salad I mixed chopped chicken breast(meal prep works), cucumber, 1 baby pickle, 1/4 mashed avocado, drizzle of lemon juice, salt/pepper and about 1 tbsp greek yogurt. Mix and stuff between the "buns". Enjoy cold.